My apologies for having gone rather quiet for a while, but life has kept me very busy. In addition to attending some concerts I haven’t yet written about, (Can we just say that Holly Mulcahy’s performance of the Higdon violin concerto was beyond stellar?!) I’ve been working extra hours at my real job, working on writing a book of knitting patterns as Itinerant Knitter, and training for a half-marathon – equal to a job in and of itself. In other words, something had to give and my blogs have unfortunately fallen to the wayside. Well – I’m still working the extra hours, my book is underway (hope to publish by Thanksgiving / Christmas) and my half marathon is run. (…though I’m already signed up to run another this October.) 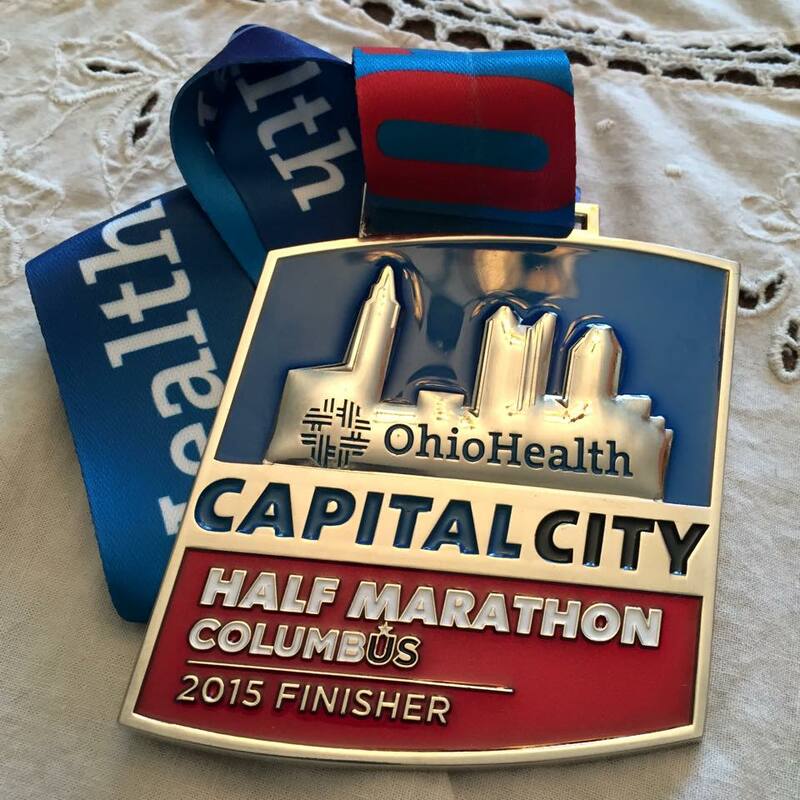 Yes – this is my medal. And yes – it weighs a ton, or at least as heavy as the harp was that I saw played last night in the Southern Theatre. Last night’s concert was the last in my 4-pack of tickets at the Southern Theatre. It was part of the American Music series that featured music written by Americans or by those living in America at the time. Granted, Debussy was a sort of anomaly in this program, the rest of the composers had an Americas connection. As always, the evening started with the pre-concert chat by WOSA’s Christopher Purdy. That man is just jam-packed with interesting, behind-the-scenes information about the music and composers we’re about to enjoy. Last night, he was joined by Principal Harpist, Jude Mollenhauer, a musician I was lucky enough to first meet a couple of years ago when I volunteered with the CSO at the Columbus Arts Festival. She’s super nice, and last night we were treated to her humor and a wealth of knowledge on an instrument about which I knew next to nothing. The daughter of one of my mom’s best friends played the harp growing up. I think for a while, she may have even played with the Louisville Symphony Orchestra. On the program last night was a harp concerto by Alberto Ginastera whose last name makes for an interesting linguistics discussion that we’ll save for another day. …wanted to expand the aura of the harp and he succeeded! According to her, the Ginastera was a phenomenally complex piece, reserved only for the most talented of harpists, to which Christopher Purdy responded by looking at us while pointing to her. She humbly waved him off, but you don’t spend 30 years with the CSO if you’re not one of the most talented musicians out there! That said, Ginastera made 40 revisions to Concerto for Harp and Orchestra, Op. 25…supposedly because it was just too hard to play! Alberto Ginastera is a very seductive composer. It doubles as a percussion instrument. You can play with just your finger nails. Jude mentioned that there were 34 percussion instruments on stage with the orchestra. In the Ginastera piece, the harp became #35! She explained that we would hear harmonics, a sounding board (I may be off on that label) and a whistle – where the harpist uses what looks like the palm of her hand and just lightly wipes (for lack of a better word) the strings in a quick, upward motion. She went on to demonstrate each one and sorry, but I thought her whistles were better than those of the soloist, though trust me – Yolanda Kondonassis played incredibly well! Jude Mollenhauer and Christopher Purdy. Too bad I wasn’t seated on the other side for a better picture – especially when she was mimicking a halo over her head as it was explained that harps are more than just angelic! In addition to learning that the harp had pedals, we also learned that in the Ginastera piece, there were 430 pedal changes during the course of the concerto. We learned so much more, such as the failed experiment with the Chromatic harp – not a good idea to have 88 or so strings when the player must tune each string individually prior to each performance, or practice, or move, or whenever it’s humid, or it rains – such as yesterday…you get the picture. And don’t even get her started about breaking strings because, well, strings break. I could have listened to her for a couple more hours – easily – but they wanted to start the concert! It was so interesting. And that’s the beauty of this musical journey called Giocosity: how much I’ve been learning and discovering. “Tis wonderful! 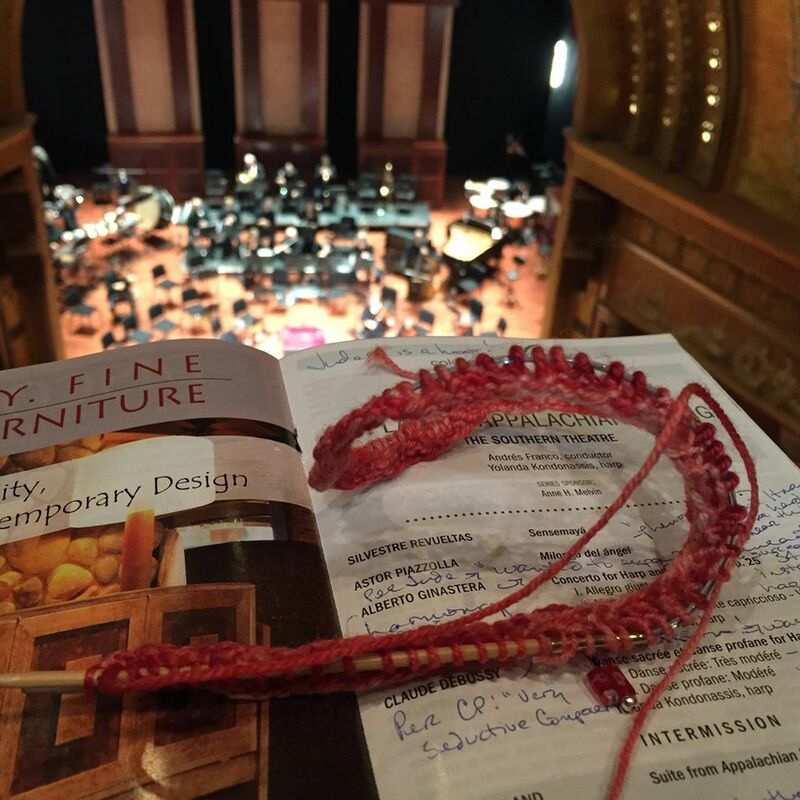 And no, I was NOT the only knitter in my section. The harp was the solo instrument and we’ve already established I was in this for the Copland, but the concert began with two wonderful pieces by composers Sylvester Revueltas – Sensemayá and Astor Piazzolla – Milonga del ángel. The first started with a beat that was difficult to figure out – it was a 7/8 beat with a stress on the last beat. I was trying to tap my foot to what the bassoon was playing, but it didn’t work out too well. I also wasn’t doing too well at following the conductor’s baton, either. The bassoon sounded really cool, though. This song was kind of funky but had a great sound to it. I need to listen to it again now that I know what the beat actually is. Piazzolla’s piece included a hint of a tango sound, which is his specialty. In this version, it was more of a precursor to the tango and it sounded quite lovely. In fact, it made me want to plan a return trip to Argentina. Wow! Yolanda Kondonassis is supremely talented and put on a stunning performance of Ginastera’s harp concerto. I had no idea of what to expect as I’d never heard it before. Heck – we’d even been warned that it would potentially be hard to hear the first time, but I really liked it. I could have done without the second, slow, movement, but the third movement was especially impressive. It started with a lengthy (but by no means too long) cadenza that ended up with a perfectly-timed join by the percussion immediately followed by the rest of the orchestra. Percussion was not limited to the percussion and harp, either. During the third movement, the violins, violas and cellos joined in with some percussive sounds of their own by tapping their bows against the strings. (Not sure if there’s a technical term for that!) Col Legno – thanks, David and Holly! So – not sure what a harp can do? Listen to this piece. The 3rd movement starts right about the 14-minute mark. Trust me, like I was, you’ll be blown away! In addition to the fares from the Americas, we were treated to a couple of dances: La Danse Sacrée and La Danse Profane. I’m sorry, but I’m not a fan of Debussy. His music usually puts me right to sleep and were it not for the fact that I had my knitting with me, last night would have been no exception. Sorry – the piece was lovely and well-played, but just not my cup of tea. Now – after this piece though, we really were treated – to an encore: Chanson dans la Nuit by Carlos Salzedo. Here’s a video of it. It included a lot of that “finger nail” playing that Jude described at the beginning of the evening. And for the pièce de résistance…Appalachian Spring by Aaron Copland. This is the piece for which he received the Pulitzer Prize in music back in 1945. Guest conductor, Maestro Andres Franco (originally from Colombia), interpreted this just how I would imagine it in a live performance. Prior to last night, I’d never heard it live before, so I imagined a crisp, lively, all-American sort of sound and that’s exactly what we got – especially in the part where the strings all come in in unison in the second section. Our pre-concert chat was mostly about the harp, so if you’ve never read the liner notes in a program, let me tell you to start doing otherwise. It’s really quite interesting as the Appalachian Spring (named after something Martha Graham, “Grande dame” of the modern American dance theater, saw in a book she was reading), is comprised of 8 different “sections” rather than actual movements. They’re also all supposed to be played without breaks in between, something we in the audience are accustomed to hearing when listening to larger works’ being performed. That said, the notes also state that this gentle and lyrical from the start, unlike Billy the Kid or Rodeo – something I’ll have to check by listening to all three of them one after the other. This was a thoroughly enjoyable piece and played oh so well by the CSO, especially Principal Clarinetist David Thomas, whose rendition of the Shaker theme was delightful! The performance ended with a well-deserved standing ovation for the orchestra. Last night before one of the early pieces, we had a little more of a break because of a need to retune a couple of the strings on Jude Mollenhauer’s harp. She did tell us earlier in the evening that she’d broken a string that day. 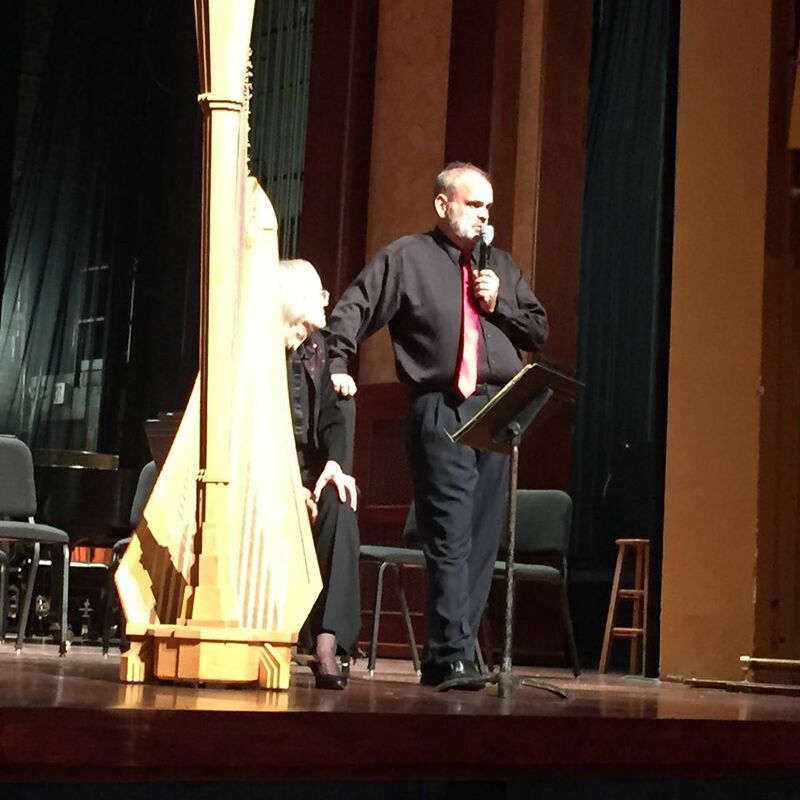 During that time Maestro Franco took that time to teach us a little more about the harp and also about Aaron Copland. Part of this included a handful of notes played by the pianist on stage. A friend of mine posted last night how she had just seen the movie, Still Alice, for which Julianne Moore won the Oscar after portraying a linguistics professor who contracted early onset Alzheimer’s Disease. I can’t watch Still Alice. I just can’t because I’d be an emotional wreck. I hate Alzheimer’s Disease – it’s a cruel, relentless, odious disease which shows no mercy. None at all. I hate it. No one told me I’d end up in tears at this concert. No one had ever told me before that composer, Aaron Copland, had Alzheimer’s and that his contemporaries visited him every week, even after he lost his power of speech, to tell him how important he was to the world of music. He was close to 90 at this stage. No one had ever told me before that on one occasion – only one – he responded by walking to the piano and playing 6 notes: the final 6 notes of Appalachian Spring, the final piece on the program. No one told me I would be in tears when those last notes were played. It’s amazing, the emotion the music can evoke in a person. Both my grandmothers had Alzheimer’s. My aunt’s sister recently passed away because of Alzheimer’s. I think it took me until I was inside my car before I completely pulled myself together after last night’s concert ended. While Alzheimer’s is horrible, the music was not. The music was beautiful. Simply and absolutely beautiful. Tags: Alzheimer's, Alzheimer's Disease, Classical 101, Classical Music, Columbus Symphony Orchestra, Copland, Harp. Bookmark the permalink.